June 21 is National Peaches and Cream Day. Peaches are great summer fruit to make a special treat. Today you can end your day with peaches and cream. Did you known, that China is the biggest producer of peaches? The second comes only Italy. Anyway, peaches grow in 38 states of the USA, that is why you can enjoy fresh peaches anytime in summer. And today is a great day to make a special treat for your family. 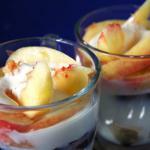 You will need: ripe peaches, whipping cream, hazelnuts, basil leaves. Make sure that you don't take overripe peaches, otherwise they will become messy on the grill. Cut peaches into two halves and remove the pit. Grease your grill with oil to prevent sticking. Grill the peaches to slightly caramelize them. While peaches are grilling, whip the cream. Chop toasted nuts or crash them with a rolling pin, if you had a bad day. Put grilled peaches in plates grilled side up, add a spoon of cream and chopped hazelnuts. Garnish the dessert with fresh basil leaves. This is a perfect treat to celebrate the holiday.